‘History is not given. Please help construct it.’ This was the Slovenian artist collective IRWIN’s clarion call for the critical (re)construction of a cohesive history of Eastern European art from 1945 to the present, and the creation of a cogent map of that art which was both beyond ‘official’ records and partial accounts present in the West. IRWIN assert that in Eastern Europe an assured art history manifestly does not exist —they initiated the East Art Map project with the marked intention of presenting artistic positions from Eastern Europe. This region has a complex, unsettled history, overburdened by artistic and historical interruptions and discontinuity. After World War II, Eastern Europe suffered from severe dependency on Moscow. The authority of the Communist parties, based on Marxist–Leninist ideology, struggled against imperialist and capitalist regimes. The Cold War brought East/West tension; the Iron Curtain segregated East and West. As a result traditional views of ‘non-Western’ art have been conditioned by canonical, arthistorical concepts emanating from the West and by the dominant capitalist-driven states. In the Communist East, the marketplace had long ago been eliminated, and politics was all-pervasive. This ideological dominance determined the politicised nature of Eastern European art, setting it apart from a Western art conditioned by principles of late capitalism and the art market. We can speak of ‘state art’ starting in 1948, when the various Communist parties formulated the first clearly defined directives for artists. Strict formal and content-related rules were set out, stipulating traditions of realism and naturalism. Hence any artist working outside the state art system during this period had to work outside the state. To base a practice outside the state was to act against the state, against the ideology of the country. But many artists found their remoteness from the sanctioned stronghold of conservatism and socialist realism to be a form of creative freedom, and dissident trends of artistic activity were cultivated, despite conditions which seemed unpropitious to sustained growth. East Art Map aims to transform these legends of the underground into ‘legal’ art history and chart the major shifts in the visual arts after World War II by mapping the significant artefacts, events and artists in the development of contemporary art in East Europe. IRWIN facilitated 24 eminent art critics, curators and artists, each of whom presented 10 significant art projects of the past 60 years from Central, Eastern and South-Eastern Europe, in order to create an authoritative written history, revealing significant parallels and connections. These contributors disregarded existing research, historiography and cultivated legends about art and artists opposed to the ‘official art’. Instead they set out to establish, in some instances, the first overviews of contemporary art produced in particular regions and to provide historical contexts. The project was organised around presenting the following information: descriptions of important artworks and events that have influenced art practice in specific regions; an illustration of the artistic milieu that made them possible and arguments for their impact; an outline of their similarities and/or differences with respect to contemporary international art practice. After the disappearance of artificial boundaries set by political regimes, many Eastern European artists have faced difficulties in the transition from underground artistic circles into the international art world and negotiating their differences with the West. Questions of identity and identification have been the most frequently raised in the European post-Communist countries in the period since 1989, which has been characterised by rapid transformations and by attempts at economic, social and political reconfiguration. These trends were prompted by events of global significance such as the fall of the Berlin Wall, the collapse and fragmentation of the USSR, the wars in the former Yugoslavia, the rise of global trade agreements and the consolidation of trading blocs. This changing social-political context has had a direct influence on art and changed the character of the art world profoundly. IRWIN identifies that there is no referential system in place in Eastern European arthistorical commentary that is accepted beyond the frontiers of any individual country. 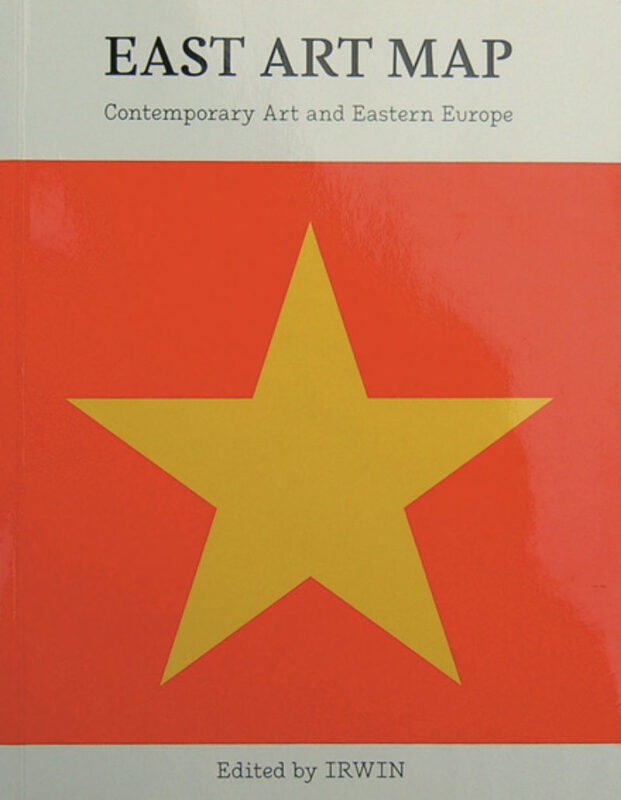 East Art Map effectively challenges the prevailing organisation of single national histories. It assimilates these fragmented histories by uncoupling individual artists from their national contexts to make comparisons between art and artists beyond borders. It is an ambitious endeavour and an indispensable contribution, which offers a corrective to the relatively modest critical evaluation of contemporary art in the region, trouncing the universalistic claims of the West’s perception of art history.